Michael Roberts has been trying to convince me to us restricted cubic splines to plot highly nonlinear functions, in part because they are extremely flexible and they have nice properties near their edges. Unlike polynomials, information at one end of the support only weakly influences fitted values at the other end of the support. Unlike the binned non-parametric methods I posted a few weeks ago, RC-splines are differentiable (smooth). Unlike other smooth non-parametric methods, RC-splines are fast to compute and easily account for control variables (like fixed effects) because they are summarized by just a few variables in an OLS regression. They can also be used with spatially robust standard errors or clustering, so they are great for nonlinear modeling of spatially correlated processes. In short: they have lots of advantages. The only disadvantage is that it takes a bit of effort to plot them since there's no standard Stata command to do it. where the "knots" are plotted as the vertical lines (optional). Help file below the fold. Enjoy! PLOT_RCSPLINE is designed to show a nonlinear relationship between Xvar and Yvar, adjusted for other variables Zvar1 ... Zvarn that are specified as controls. Confidence intervals are computed by the delta method. PLOT_RCSPLINE uses a restricted cubic spline approach to estimating the nonlinear relationship between Yvar and Xvar. The spline is estimated with NKNOTS (5 is the default) and the spline variables in Xvar are generated by PLOT_RCSPLINE. 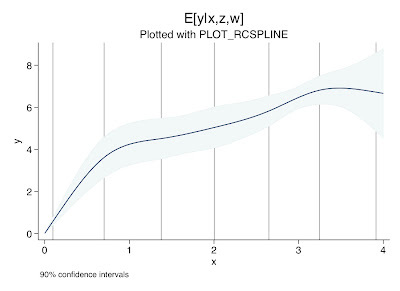 One usage of PLOT_RCSPLINE is to generate the spline variables that will be used elsewhere in an analysis, while allowing the user to visually check that the partial response function (in Xvar) is reasonably specified using the spline. PLOT_RCSPLINE does not automatically save the figure. Use GRAPH EXPORT or GRAPH SAVE afterwards to save the figure. REGCOMMAND() - String that is added to the regression command as an option, eg. "cluster(year)"
BINS() - Number of "bins" that are used to plot the final response funtion. Fewer bins will make the response function look "jagged", more bins will make the response look smoother. Default is 100. Solomon: I agree with your advocacy of restricted cubic splines as a good scatter plot smoother. You are correct that there is no official command to do this in Stata, if that's what you mean by "standard". As far as user-written commands are concerned, -rcspline- has been downloadable from SSC since 2007. It doesn't have quite the same objectives as your program: yours goes further in supporting what you call control variables). -rcspline- always shows the original data for the variables plotted. In terms of your program, Stata users would typically expect a help file that would explain the syntax in a standard way, not documentation embedded in the code. Your implementation makes use of permanent variable names in a way that poses a small but not zero risk of messing up existing datasets and in a future revision could usefully support -in- as well as -if-. and I see predictions shown for -mpg- that are all negative. What did I do wrong? Nick: thanks for pointing out rcspline (and writing it!). It looks really nice. One day, I will learn how to write proper help files for Stata... but until then, I apologize that getting the details on my functions is a little unwieldy. In the next version, I'll make including the constant an option. Thanks for pointing this out. Thanks for this. When there are no control variables, it's possible just to use -predict- directly to get predictions in terms of the response. I'd guess other users than myself might expect that to be the default with no control variables, but as you imply that clashes with your broader purpose in getting marginal effects. That in turn raises the question of getting Stata's -marginsplot- to do your work for you. then you will keep the constant but drop the average effect of Z when you plot the spline. This can be interpreted as the prediction of the model when all covariates are set to zero (note that this doesn't make too much sense in many models, so I would stick to using the "keepcons" option only in bivariate models).